To fit properly, the child's waist size must match the "waist relaxed" measurement on the Size Chart. Elastic waist pants by Classroom provide fit from toddlers to larger student sizes. These school uniforms have an elastic waist with no buttons or zippers for a comfortable fit and convenience for toddlers, the impaired, and students needing special sizes. 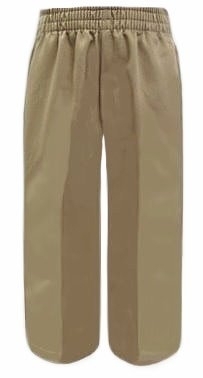 Pick these school pants that are unisex for a solution to fastening and fitting.